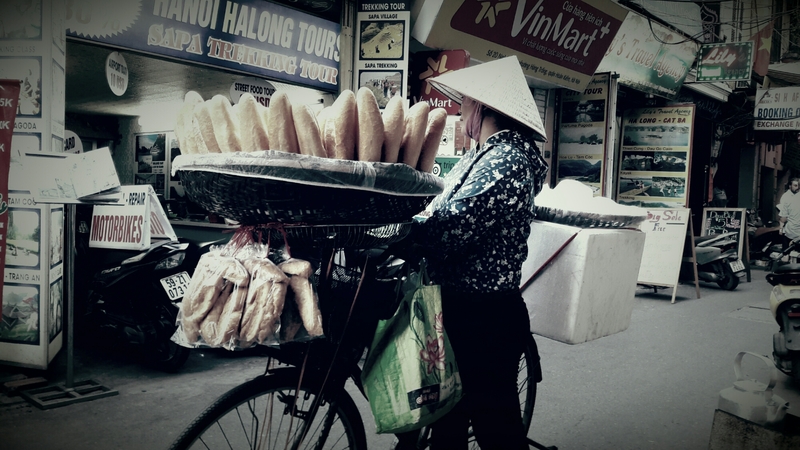 We decided to rent bikes on Hanoi coz we only have a few days. it would be quite expensive bringing our own bikes. Not knowing the company before but we rented from “The Hanoi Bicycle Collective”. This company is highly recommended. Bikes are in great shape. We went there arranged the bikes and arranged a “delivery” of the bikes for the next day. After that we went back to our hotel area and arranged the train ticket for the next day going to Sa Pa. 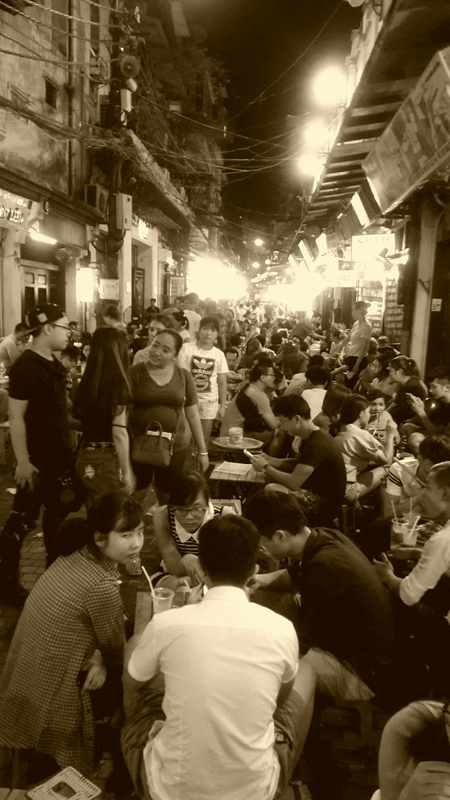 In the evening we had some “Bia Ha Noi” and some Vietnamese Food. We only have around 8 to 10 days for cycling in Vietnam. We decided to cycle in Northern Vietnam, starting in the mountain area of Sa Pa and slowly find our way back to Hanoi. 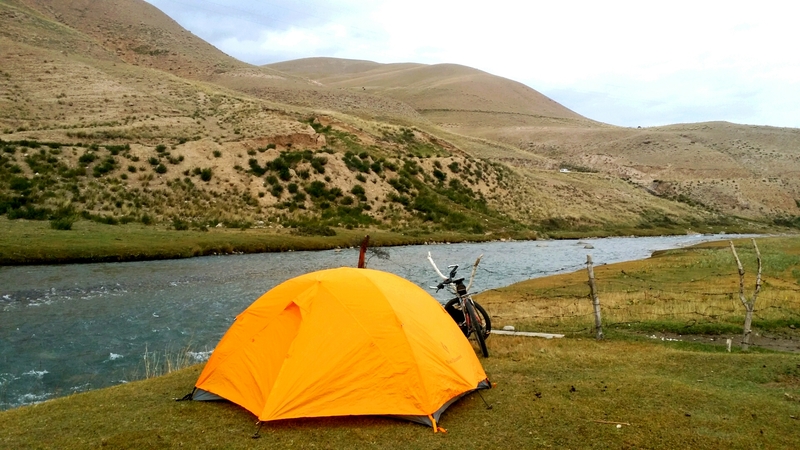 This 3 week trip cycling in Kyrgyzstan was one of the nicest i ever did. 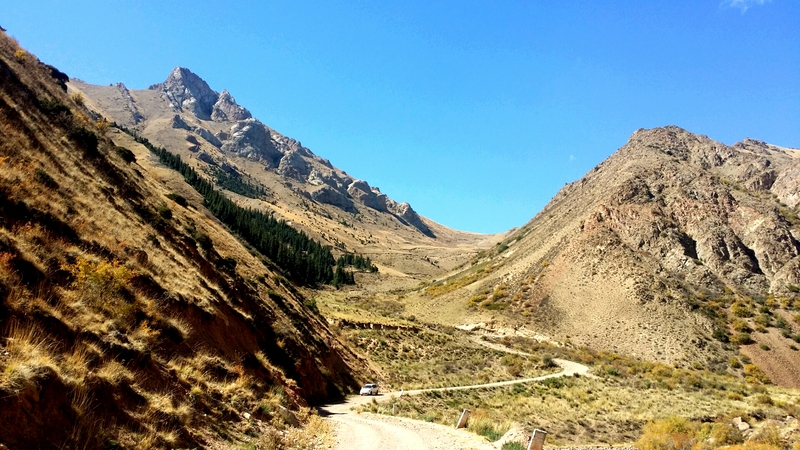 Super nice people, stunning scenery, high altitude passes, beautiful natural treasures. This country has it all for the outdoor minded people. I dont really know what was the nicest. It was just awesome every single day. One thing will be always in my memory. 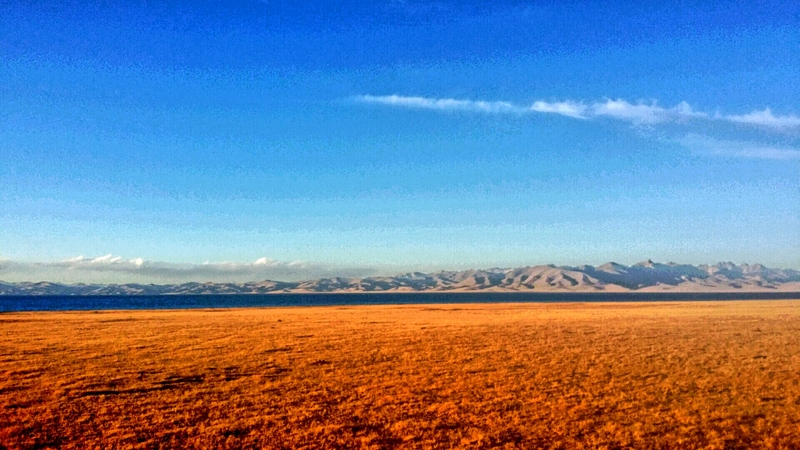 Cycling 35 km at Son Kul Lake with that dog guarding me was just fantastic. Buddy you were awesome. This was my 1st real solo trip and i enjoyed every single minute. The most important the bike was perfect (thanks to the bugoy bikers technicians), i had perfect gear (thanks to Schwalbe tires), no flats and i had perfect weather. Here is my summary for other cyclists or outdoor people. Well lets start with the main reason. The scenery is just stunning and breathtaking. Super friendly people everywhere. I pitched my tent beside a farmers place and got invited for breakfast. The 2 friendly farmers who stopped and gave me a lift. All the smiles and hellos on the road – great. Unfortunately alcohol is a big issue. I also met a lot of drunk people but never any problem. Smile and be polite and the smiles and politeness comes back. If you are in the country side – perfect no traffic and great cycling. 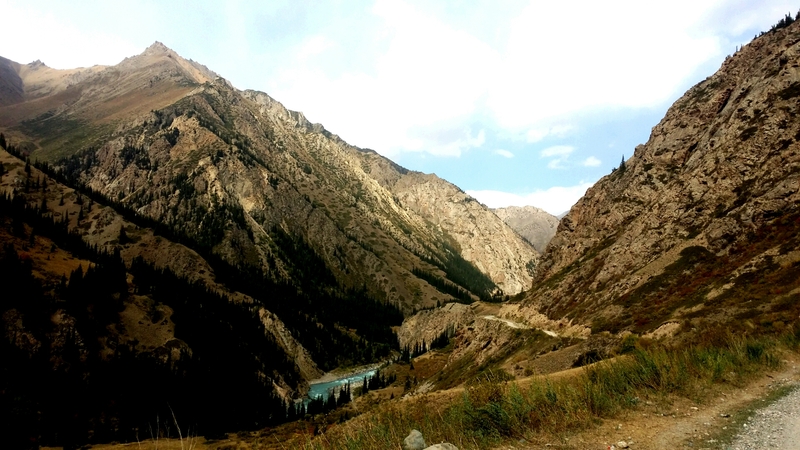 Around Bishkek and the 1st stretch of the northern part of the Lake is quite heavy traffic. 90% of the drivers are respectful and keep distance. Unfortunately 10% of the drivers are stupid and insist of the right of way and dont accept cyclists … for the mentioned areas its good to have a mirror. The food is great. I am a meat eater and everywhere i got food it was just great and delicious. I had no stomach problems at all. Because of its remoteness and the alpine environment this is not a country for beginners. You need the right equipment and be prepared for bad roads (wash board, lose gravel) and for cold nights. The roads are quite good. Main roads are paved and 2ndary roads are mostly paved. 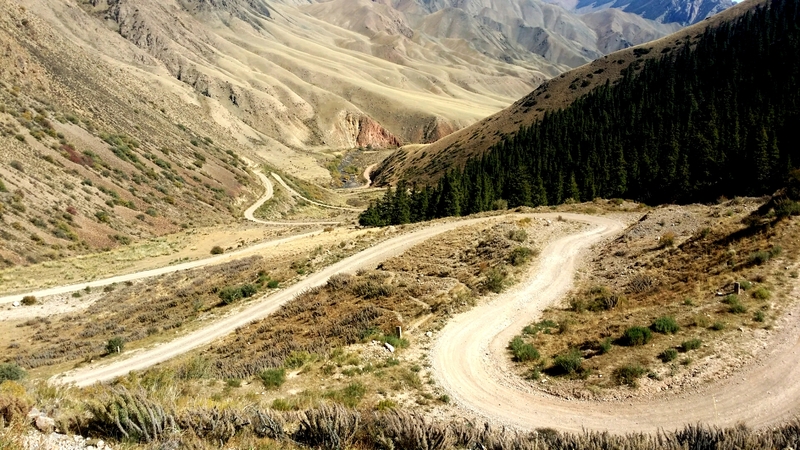 Sure enough if you go in the mountains don’t expect paved roads and be prepared for some wash board roads. There are a lot of “magazins” on the road. All well stocked with soft drinks chocolate bars and other stuff. As more remote it gets dont expect the softdrinks to be cold. And if there is no softdrinks you guaranteed get vodka. I went the whole September and it turned out to be perfect. I had sun every day and only 3h rain in the whole 3 1/2weeks. 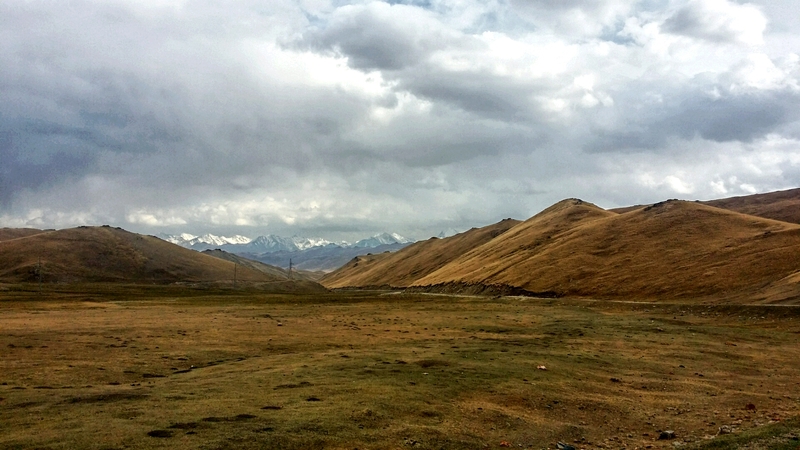 Stray dogs is no issue at all except you come close to yurts. All yurts have dogs and they are teritorial. If you come to close you have a problem. 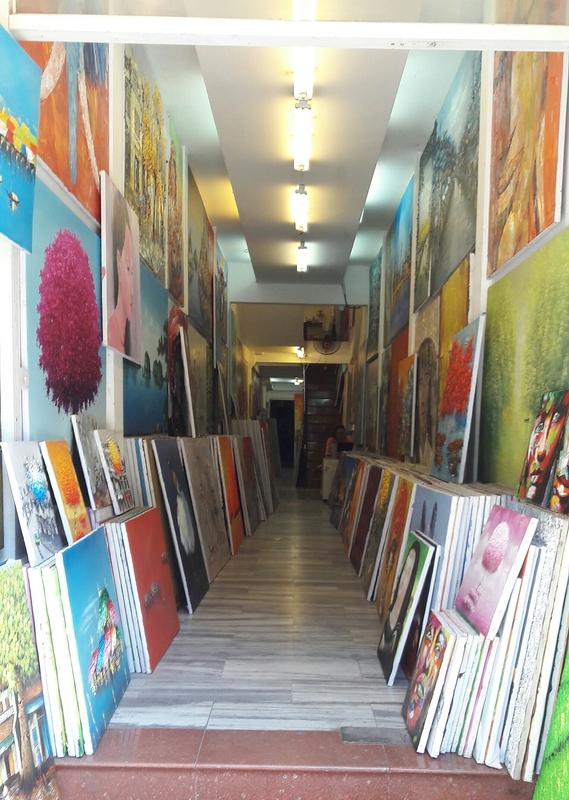 In the bigger cities you find widi and internet cafes. Its still lacking but it will surely improve. Today i cheated a bit. 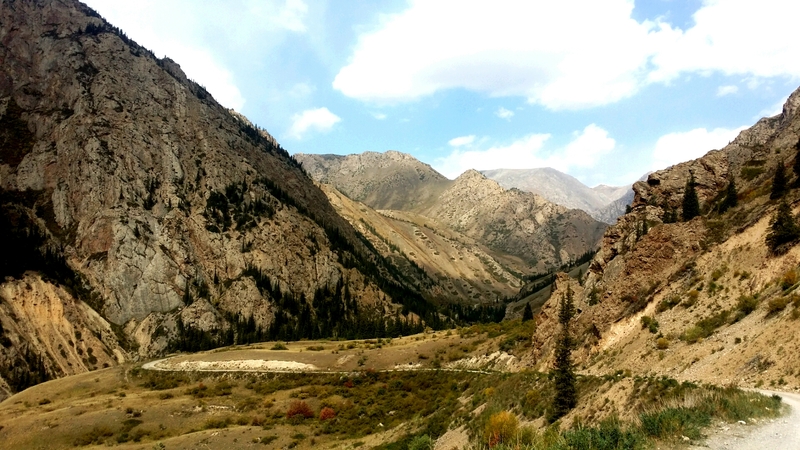 I had to go over a pass of 3000m the last mountain range before Bishkek. I cycled around 24 km on really bad road towards the main road. Around 5km before the main road a car stopped. I guy went out of the car and waited for me approaching. He turned out to be a very nice friendly farmer as well as his companion. 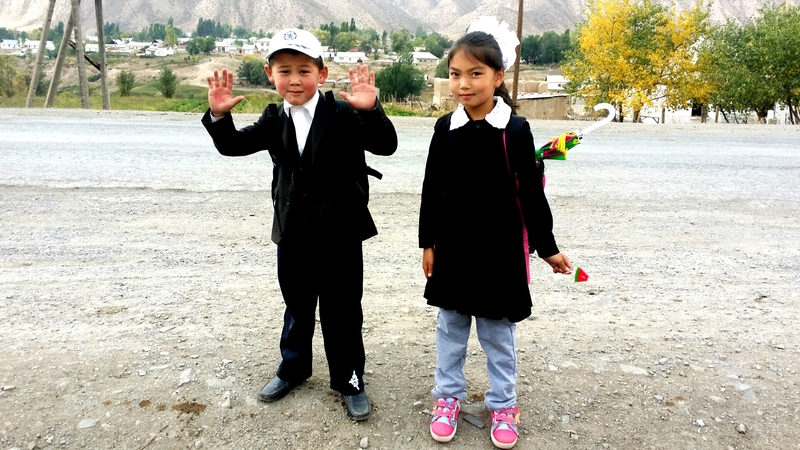 They insisted giving me a lift to Bishkek. I heard bad storirs about cycling up the pass with bad traffic and especially going through the tunnel (at the top of the pass). 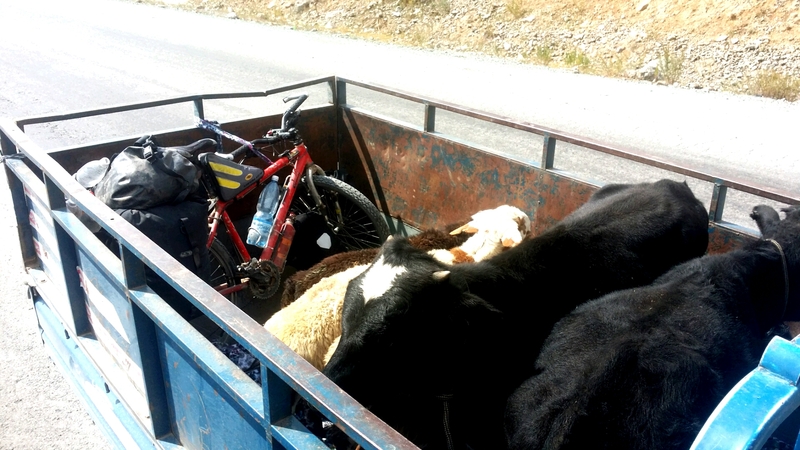 Besides that i liked the idea having my bike at the back of the truck with sheep and cows. They were really nice guys and we had a funny conversation …they speaking russian/kyrgyz …me englidh and german. The car overheated on the climb but thanks to my water i brought we made it to the tunnel. Going through that 3km long narrow tunnel was even in the car scary … good that i dont have to bike through. On the other side of the pass i got of and started cycling again. A 68 km !!! downhill was waiting. I made it to Soskova where i had a coffee. 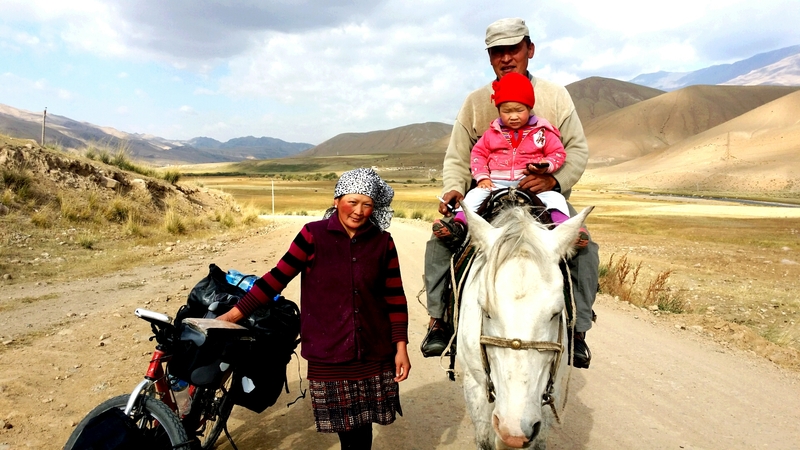 I met a really nice Kyrgyz guy who spoke perfect english and german. He has a small guesthouse but it was still to early for the day. I continued to the main road anther 18 km. There the traffic got really bad. 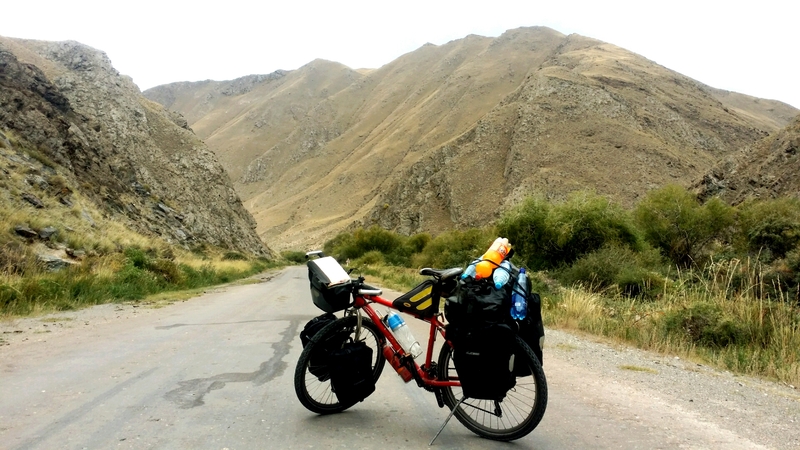 I continued cycling till i had only 40km left to Bishkek, looking for a hotel. 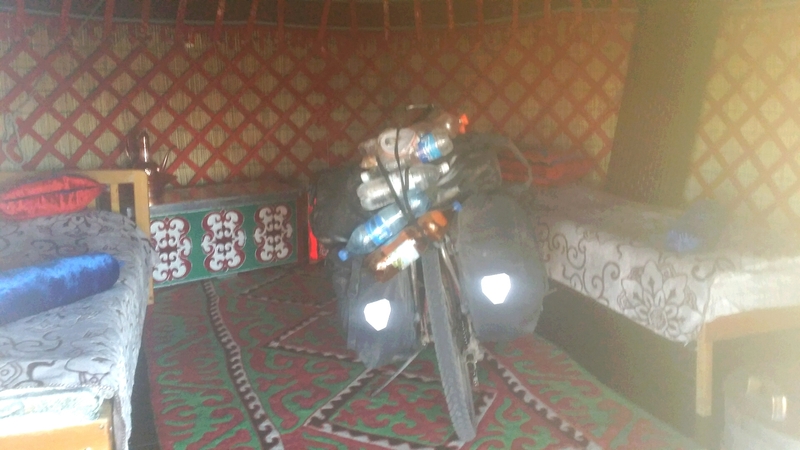 The fact that i was only 40 km away from Bishkek …no hotel, getting dark and the bad traffic made me decide to throw my bike in the bus and go straight to Bishkek. An awesome bike trip ended !!! Another nice but tiring day of cycling. Going from Chaek to Aral goes slowly down. I was already worried coz i know going tomorrow over 3400m meaning everything i am going further down i have to go up again. In Aral i had a coffee and continued. 5km further a guy passed me in the car and stopped. He tried to explain me i am wrong. I checked my gps and was wondering that i was going south. I folded the map so that there was no way down from Aral but fact is there was. I started cycling back wondering where the crossing was. In Aral i saw the bridge which you couldnt see from the other side. So i turned left and was back on track. The next 20km go through a canyon on quite bad road. Its going slowly up. 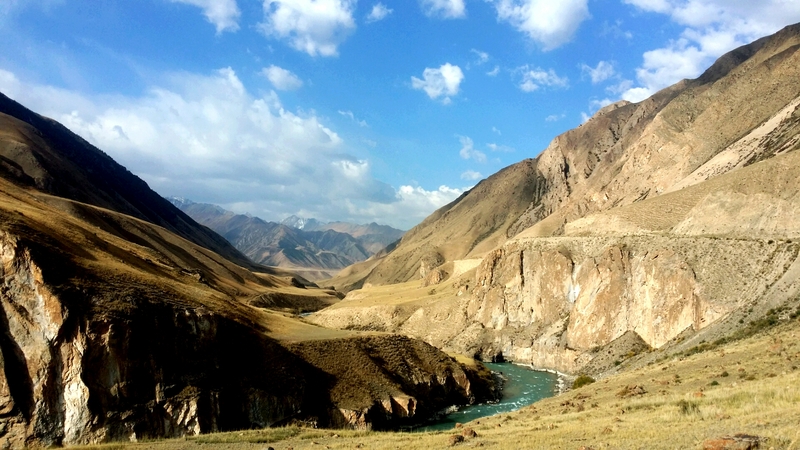 Kizil Oy is the next village after the canyon. From there its another 24 km to Kojomkul. Very nice riding along a river through a valley. The road climbs and climbs slowly but surely. 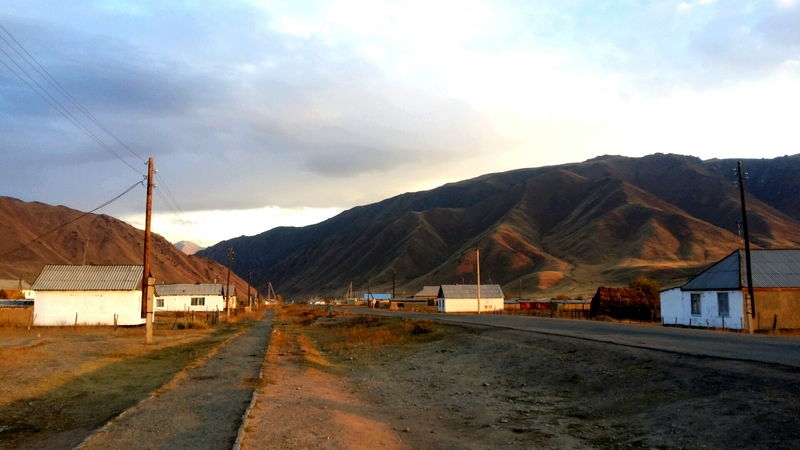 In Kojomkul i pitched my tent at a farmers house. They tried to convince me to sleep in their house but i insisted to sleep in the tent. In Aral you have to turn right going over the bridge. Its easy to miss. Another spectacular day. After a great breakfast i started cycling around 1/2 of the lake. After around 5 min (i was just back on the mainroad) i had a companion. The dog of the yurt camp which slept outside my yurt was suddenly accompanying me. I cycled and he was right at my side. After 5 km he was still there. After 10km i had a break and he was still there, sitting beside me. I got nervous coz i thought he has to go back. So i talked to him and told him better to go back but he stayed. 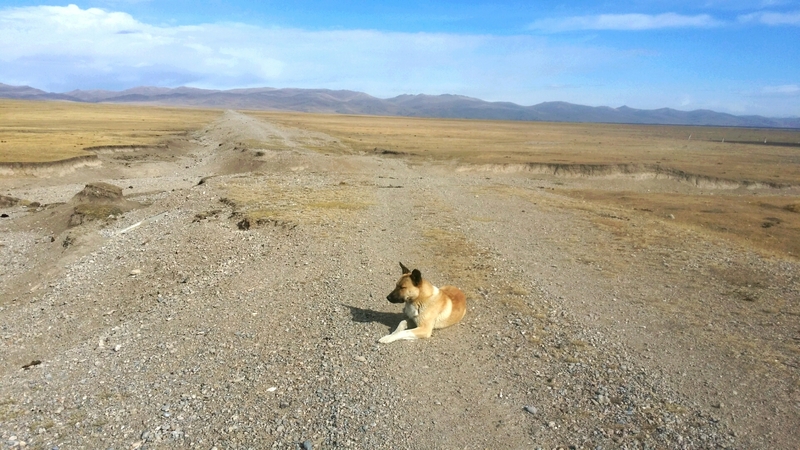 At around km 25 i was already north of the lake still the dog was there. I asked for directions and went west still with my companion. On every yurt i passed, which is normally an issue coz of the dogs of the yurt he defended me. Unbelievable dog. I left the lake and had to climb over some small mountains. Always with the dog. Impressive. I had to do the final climb … and he was still there. Suddenly he was gone. I felt kind of sad but happy that he made his way back. I already thought spending the next day bringing him back up again. At 3200m finally the decent started. 20 km of very rough (bad road) downhill. You dont want to cycle that up. 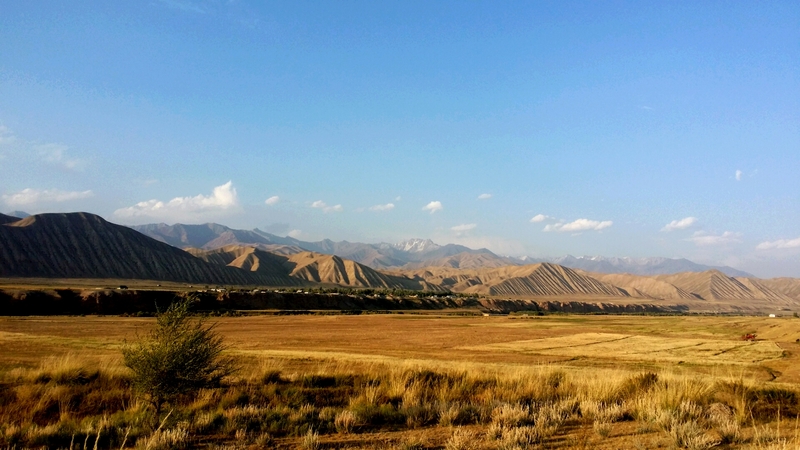 I reached the valley and had to cycle around 35 km more to reach Chaek. Mainly downhill. In Chaek i found a hotel (well more a house with sleeping facilities) but good food. What else you need. Another awesome day ended. 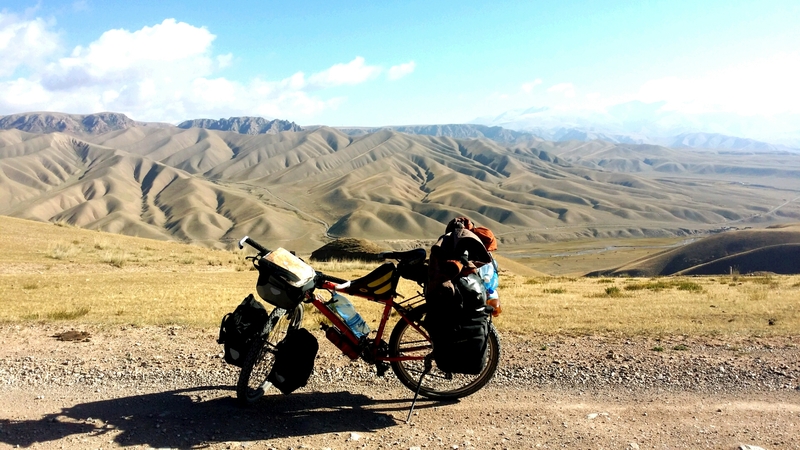 Not the nicest ride biking out of Naryn on the main road. Quite some scenery but also some road work. From km 35 Ottuk to the crossing leaving the main road (km 50) was quite touch cycling. Smoothly climbing up and i had seripus headwind. While you approach the crossing you see already the road going up the ridge. The view from the top of the ridge is quite breathtaking and then going into the valley towards Son Kul is also amazing. 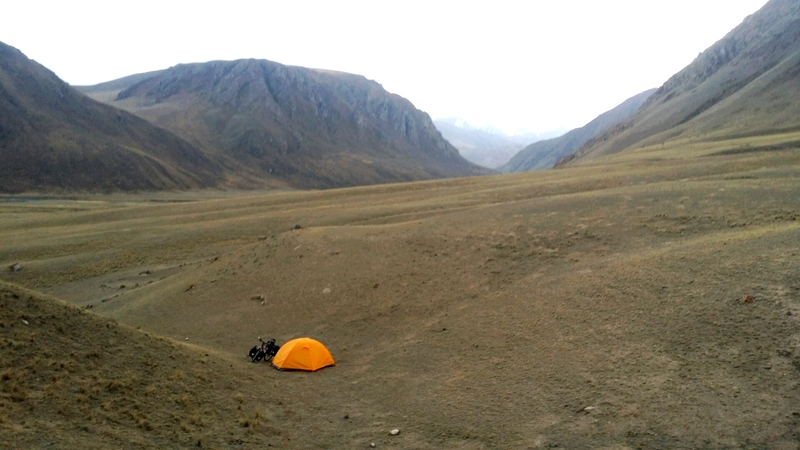 I cycled a view more kilometers and looked for a place to pitch my tent. It started raining and got quite cold so i decided to call it a day. A young guy was watching me pitching my tent. 1st 50km nothing special; cycling along the highway. 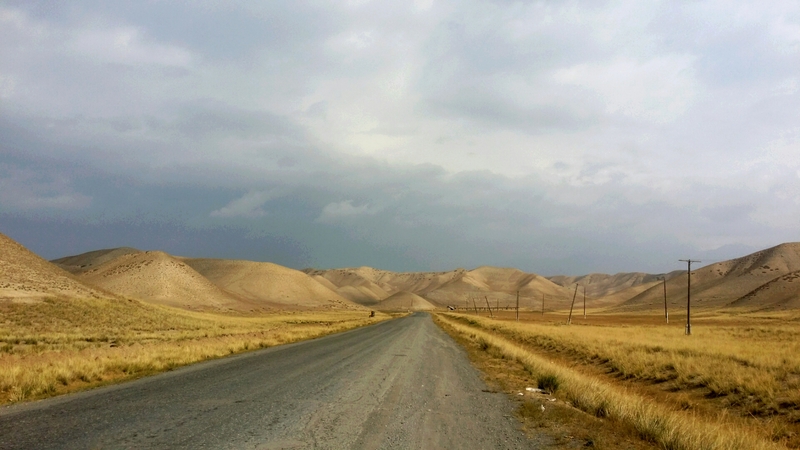 Km 35 – 50 slowly going up; quite tough with headwind. 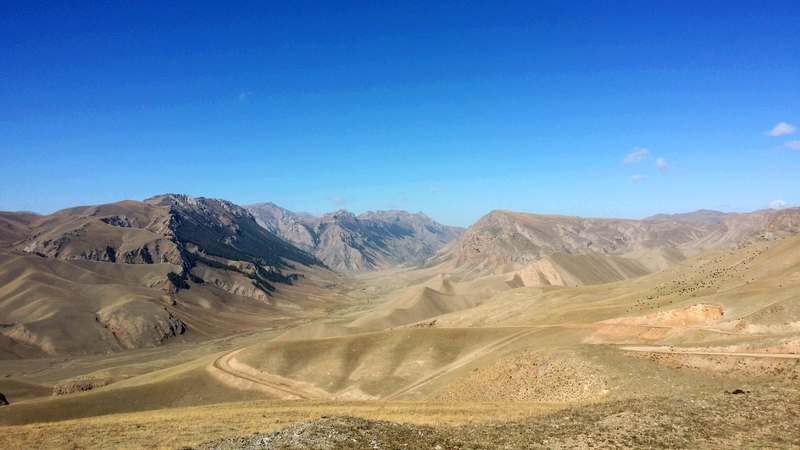 After km 50 (turning to Son Kul) great views. What a day, what a ride. I woke up with ice inside and outside of the tent. Luckily only the outer tent. I started immediately with a serious climb from 2500 up to 3000 hm. Unbelievable nice scenery and a touch climb (it should come harder). After reaching the top a nice downhill was waiting. Spectacular scenery. After that i cycled along a valley mainly flat slowly going up again great views. Suddendly i stood in front of a “wall”. Serpentines going up. This was really a tough one going up from 2500 to 3100. The road was quite bad and really steep so i could only cycle around 10%. Now i hated myself for any additonal gram of weight i brought on the ride. After a tough 2 hours i made it. Awesome scenery again. After anathor 3 to 4 km i reached Son Kul. Quite an impressive Lake 3000 masl. I cycled along the southern shore (quite a bit away from the Lake) lots of cattle and some yurts. The road is quite bad and seemed to never end. It was already 6 pm and i decided one more small climb and then i make a decision where to pitch my tent. After that climb i suddenly saw some yurts line up close to the water. A yurt camp? 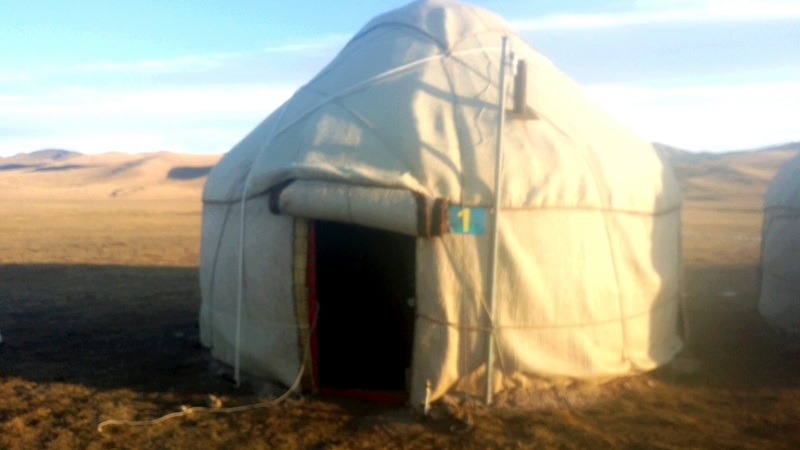 I checked it out and yes a yurt camp. Just wondering about that girl i met on the road (a cyclist) and that older swiss couple ( in there camper) both said there is no yurt camp and the Lake is not so spectacular. Well better check it out by yourself. I have a great yurt (with cowshit heating) and some quite impressiv views of the lake. To be fair the older swiss couple suggezted me that route … and that was an awesome one. Another great cycling day. I thought its mainly downhill but infact it would be more rolling. The 1st 30 km again just spectacular scenery. I stopped ones in a while for a picture but i had to control myself not to take to many pictures otherwise i would not have moved forward at all. After 30 km i went through an amazing gorge with again great views. That lasted almost 30 km and a lot of up and down was involved. Reaching again the “main” road after 60 km i had my friend back: headwind. 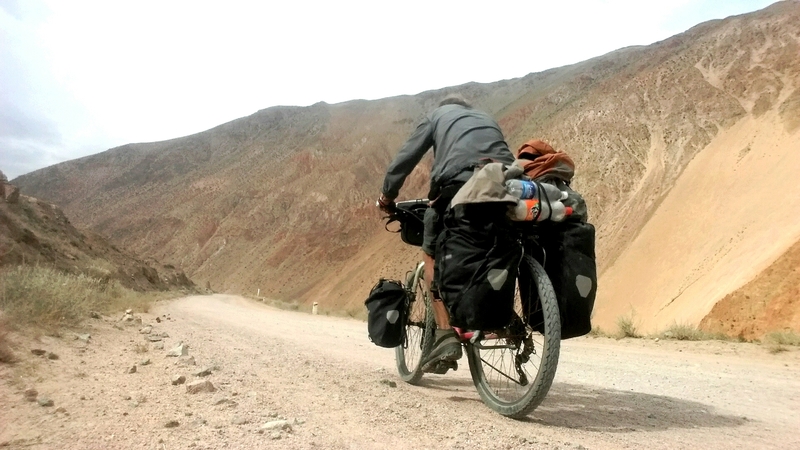 The road was really bad and everytime a truck past i ate lots of dust. 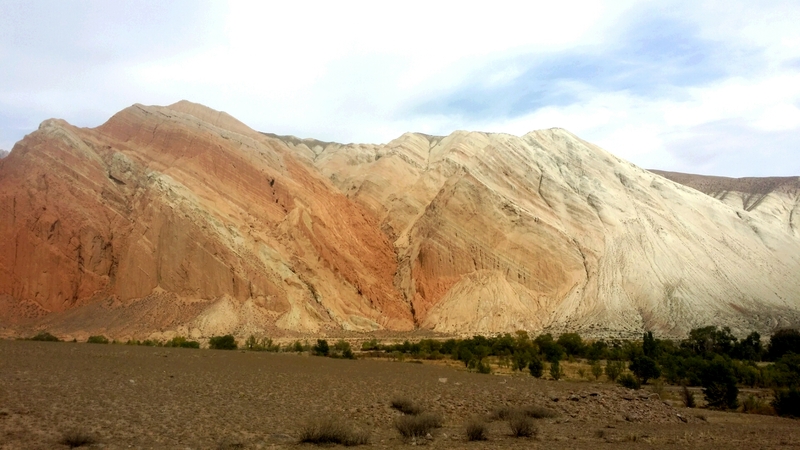 I slowly approached Naryn and with only 15 km to go the road got paved. Getting into the last week with some more climbing and cold nights (at Son Kul Lake) i decided to have another rest day. An awesome day with great scenery. After i woke up i went to the “magazin” of the village and bought more water. There i saw people drinking already vodka. A paper cup .2l ex. Drinking is really an issue. I started cycling and the climb was very smooth. 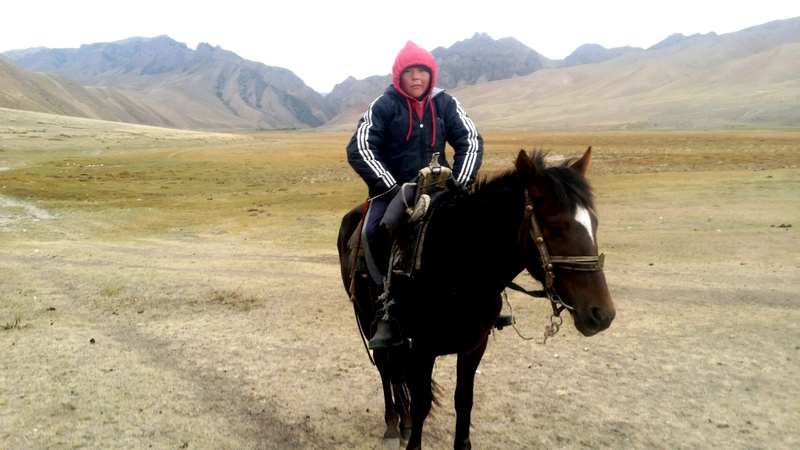 Once in a while herders on there horses approached me and asking where to go to. The weather got suddenly bad … the road was it already long time. I made it on top it was freezing cold but the views are just unbelievable. This continued for the whole downhill. A really spectacular day in terms of scenery. I am happy that i choose to take this road. 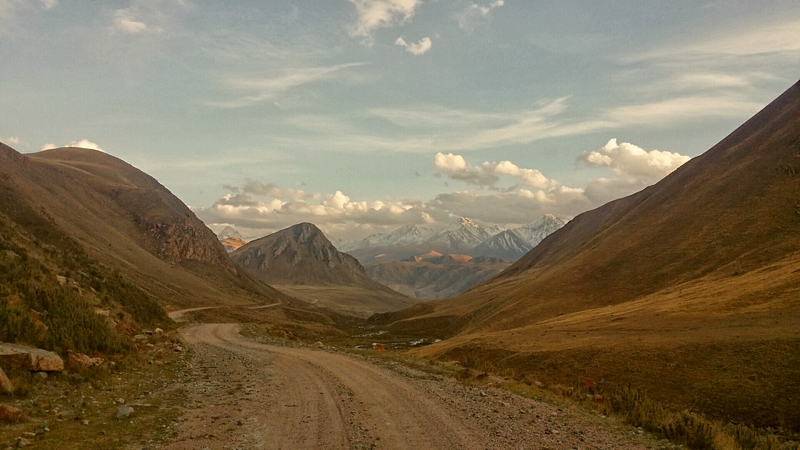 At the end of the day i took the turn going into the valley which leads to Naryn and tbis views are just insane. I pitched my tent in a quiet hidden area. After a rest day, i had another nice cycling day. 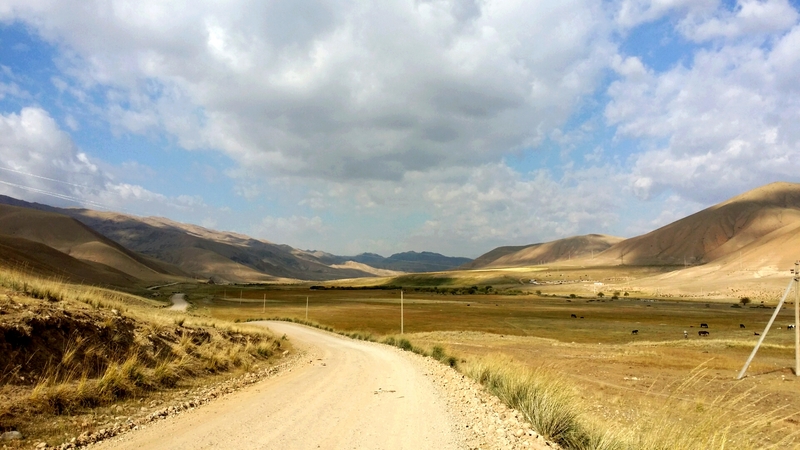 I am on my way to Narin. Due to the fact that i am not in a hurry and the fact that i heard there is lots of road construction on the main road i decided to do a detour to Narin. 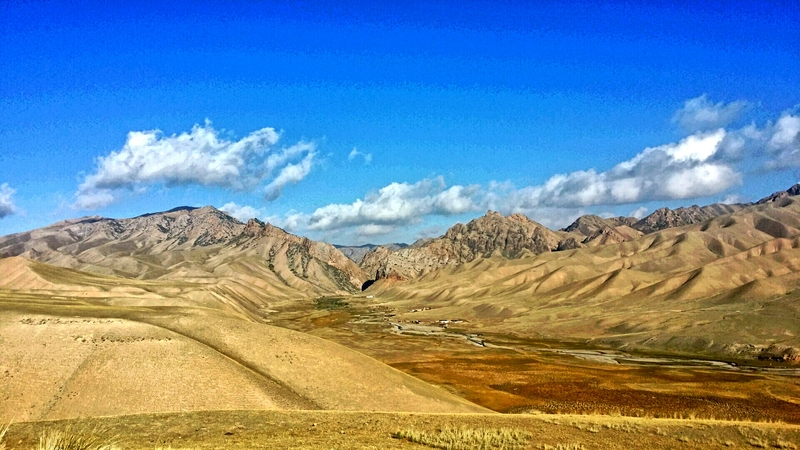 I followed the main road from Kochkor till Sari Bulak. This is around 45 km. The cycling is nice, the main road not so busy and quite nice scenery. 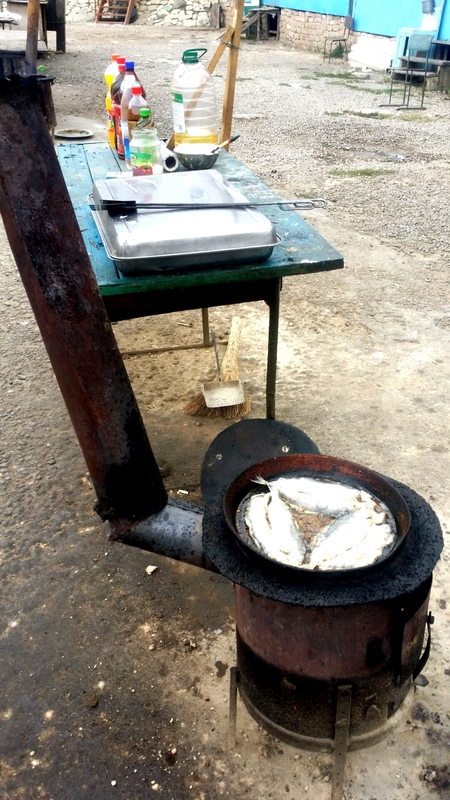 At the crossing Sari Bulak there is a restaurant and some vendors selling cooked fish. I took a right turn here into that valley. No more traffic at all and a good road (in the beginning). After 20 more km i reached Ak Kiya, a small village. 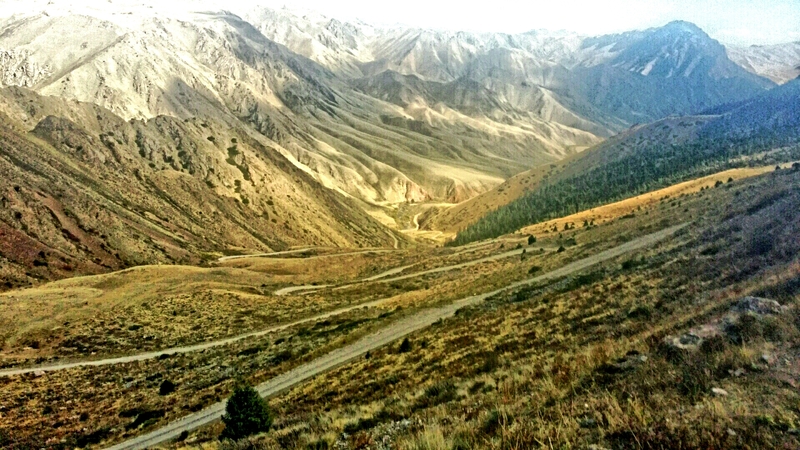 The scenery again is breathtaking and the last 4 km the road is quite bad. I pitched my tent close to the village beside a nice stream. People bringing there caddle home and curious villagers were checking me out. While i was cooking my food a guy approached me riding on his donkey. He couldnt believe i want to sleep in the tent and tried to convince me sleeping in his house. 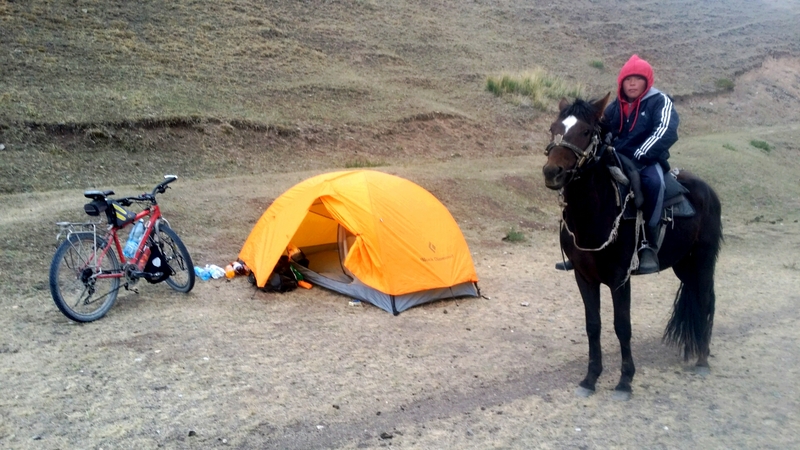 I insisted i will be ok in my tent and finally he realised he can not convince me.